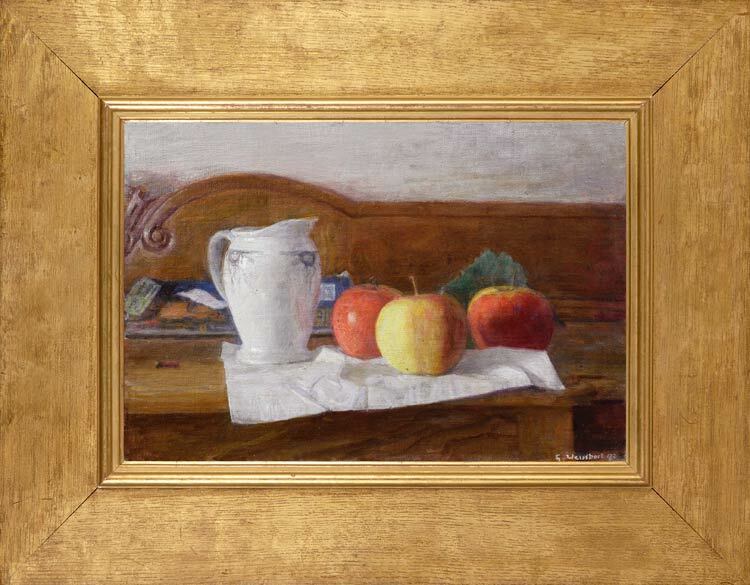 Here Weissbort employs a brilliant island of colour within a tonal, earthy setting which acts as a frame-within-a-frame, providing a foil to the clear reds/yellows of the apples, and to the glossy sheen of the white jug. This is a work which picks out texture as well as colour; so that, whilst the wood and plaster is undifferentiated, retreating into the diffused tones of the background, the still life vignette is alive with the sensual surfaces of rough linen, hard glazed ceramic, and waxy apple. The artist is painting as the eye sees – highlighting everything within an oval focus, and letting the rest stand back. A tranquil, sunny vision of autumn, where the artist once more has Cézanne at the back of his mind and remakes the arrangement and textures of his drapery, ceramics, wood and fruit (see, for example, Cézanne’s Still life with kettle, Musée d’Orsay).